Also contributing to this blog post were Booz & Company associates Surbhi Martin and Madeleine Buck. If you’re having trouble translating strategy into execution, maybe you’re only using half of your organization. Sure, you’ve assigned decision rights, rearranged the lines and boxes in the org chart, set up a knowledge exchange system for better information flow, and tweaked your incentives. These are the formal mechanisms that business executives usually rely on for organizational change management—they’re familiar, concrete, and measurable. To meet the practical demands of execution, you need to design these elements thoughtfully and effectively. But it takes more than sound structures, well-crafted rules, and rational compliance to get the best out of your people or to change your company’s direction. Emotional commitment matters too. The attributes of emotional commitment—drive, pride, an innovation mind-set—are nurtured mainly beyond the lines and boxes. They stem from informal elements: norms, commitments, mind-sets, and networks. In the past few years, there’s been a major change in our understanding of business organization change and management. We’ve come to recognize that both formal and informal elements have the power to make or break a new strategy. Both should be part of your organizational design, for these are the elements that determine your “organizational DNA” (see “Organizing for Advantage,” by Ashok Divakaran, Gary L. Neilson, and Jaya Pandrangi). When you’re trying to change your company or motivate your people in order to improve performance, the design of these organizational DNA elements is critically important. Companies that balance the formal and informal execute better than those that overrely on one or the other. But what’s the optimal balance? What mix of attention to formal and informal design will get you the results you need? To answer that question at Booz & Company, we analyzed responses to our “Organizational DNA Profiler” from more than 9,500 businesspeople. The Profiler is a 28-question survey that maps an organization’s design to one of seven performance profiles. Three of them (Just-In-Time, Military Precision, and Resilient) represent companies with consistently strong execution. The other four (Passive-Aggressive, Overmanaged, Outgrown, and Fits and Starts) describe companies that consistently have trouble executing their strategies. The survey asks people to identify statements that are true for their company. We identified 10 questions in the survey that, taken together, assess the level of balance across the formal and the informal—which we call the “Balance Index.” Four statements, in particular, indicate effective balance: for example, “When big things change in our environment, we adapt successfully.” Three of the questions reflect effective use of formal elements: for example, “We have the metrics we need to evaluate business performance.” And three of the questions reflect effective use of the informal: for example, “If a colleague here makes a commitment, I can count on it.” If you answer yes to eight or more of these 10 questions, you have a balance index score of 80 or higher, which indicates a high degree of balance. The findings show a clear correlation between high balance and effectiveness. Only 42 percent of all respondents landed in one of the three strong execution profiles. That figure jumps to 86 percent for organizations with a high Balance Index score (about 3,100 of the 9,500 responses). We also see a link between balance and coherence, the degree of alignment between a company’s distinctive capabilities and its value proposition or “way to play” in the market. (Coherence is highly correlated with business success.) Survey respondents who agree with coherence-related statements—“We are disciplined in focusing our efforts on where we can win”—also have high Balance Index scores. Companies that are attuned to the balance imperative may have a firmer grasp of their distinctive capabilities. They may also be more adept at putting those capabilities into action, since a capability is a combination of processes, tools, and systems; knowledge, skills, and behaviors; and organization—in other words, of formal and informal elements. Suppose you’re a company leader. How would you put balanced organization design into practice? You might run a retail bank that needs to build out its capabilities in customer analytics. You’ll certainly need formal measures: new IT tools, incentives to promote cross-selling, and a few well-chosen metrics. But to motivate employees to act in a more consultative fashion with customers, you also need to address behaviors and mind-sets directly. For example, you could tap your bank’s existing informal networks, by identifying branch managers who are adept at talking to customers and deploying them as informal peer coaches. You might also invite relationship managers to voluntary forums, perhaps over dinner where they can talk more freely, to share practical ideas for reaching customers. Similarly, if you’re a pharmaceutical company shifting sales reps from business units to an enterprise-wide sales force, you’ll probably find that changes in the reporting structures and incentives do not, in themselves, yield the kind of cross-portfolio selling that you want. On the informal side, you might encourage leaders to model, in a highly visible way, the attitudes and behaviors associated with enterprise-wide sales. You could set up connections among peers from different business units—people who can coach each other on selling the broader portfolio. We use the metaphor “DNA” to describe those innate aspects of an organization’s identity, which determine the way people execute decisions and the practices they follow. Different organizations operate in different ways—some move with military-like command-and-control, others come together when there’s a crisis (in “fits and starts”), and some are high-performance operations where people know how to act in alignment. 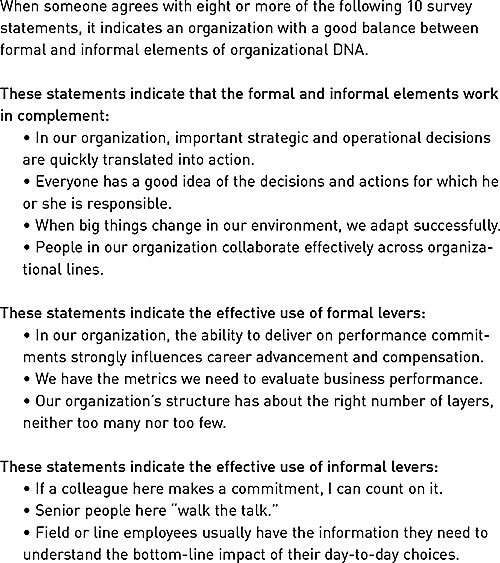 Your organization’s DNA is deeply affected by the interplay of organizational elements, which we represent in a double helix: four formal elements and four informal (see exhibit). Change the design of these elements, and you can, in as little time as a few months, change your organization’s DNA.